Migoto Judo is an organization that’s dedicated to the education and training of individuals in the sport and martial-art of judo. Our facility provides ample space for working out and is furnished with spring-loaded mats which offer a comfortable, high-quality training area. We offer classes for all ages and skill levels whether you are a beginner or a black belt, a recreational player or a national competitor. 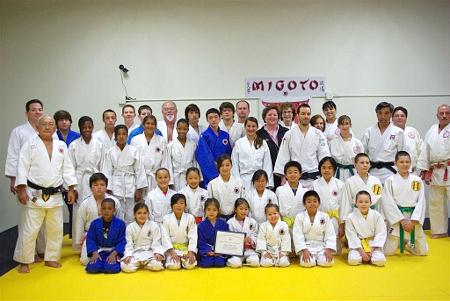 As a Migoto Judo student, you will develop skill, confidence, discipline, strength and endurance. Roland is a 3rd degree black belt with 20 years of experience. He is the founder and Head Sensei of Migoto Judo. He is a nationally certified Judo Coach and Judo Teacher from the USJF, USJA and USA Judo. He is also certified as a Regional Referee. Jake is a 5th degree black belt with over 60 years of experience. He teaches proper falling techniques and the fundamentals of judo. Tudor is a 2nd degree black belt with 23 years of experience. As a junior competitor, he has placed 3rd in several national tournaments. As a senior competitor, he has placed 1st in the California State Championships and 6th at the Senior Nationals. As an instructor, his focus is on training advanced students with competitive techniques and conditioning. Dr. Kaye is a 4th degree black belt with 40 years of experience. He competed for seven years at the U.S. National Judo Championships and won the All-Around Grand Championship in 1999. He teaches the various forms of judo also known as kata. Jim is a 4th degree black belt with 40 years of experience. Mark is a 1st degree black belt.